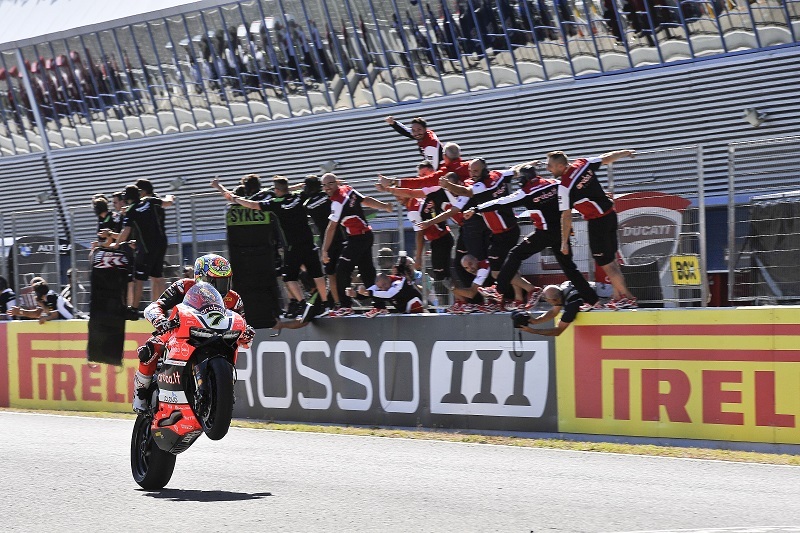 The Aruba.it Racing – Ducati team claimed the top step of the podium in Race 1 at Jerez de la Frontera, home of the penultimate round of the 2016 WorldSBK championship, thanks to another spectacular win by Chaz Davies. The Welshman, who has won four out of the last five races, confirmed his top form to claim his 8th win of the year. Davide Giugliano, back on track after skipping the races in Magny-Cours due to a right-shoulder injury, crashed out in the early phases without physical consequences. Starting from second row after finishing Superpole in sixth position, Davies quickly stormed back through the field to claim the lead in lap 4. Imposing an unmatchable pace, below the 1:42 mark for half the race, the Welshman gradually built a gap from the rivals, led by Sykes, and crossed the finish line with more than three seconds of advantage. Giugliano, on the other hand, faced a difficult day. Despite a strong performance during Superpole, closed in third position, the Italian was hindered by braking issues since the start and crashed out from seventh position at the beginning of lap 2. Fortunately, the fall did not worsen the conditions of Giugliano’s right shoulder and the Italian rider is eager to bounce back in Race 2 tomorrow. Action will resume at 09:25 (CET) Sunday for the warm-up session ahead of Race 2 at 13:00. “I wasn’t sure we had enough margin to pull away, given the step forward made by the Kawasakis this morning, but we’ve been fast enough to lead from early on so I put my head down and saw the gap building. Jerez has always been a tough track for me in the past, so to turn things around and win here for the last two years is something special. I want to say thanks to the team, they worked so hard during the summer break to improve the balance of the bike. I feel like I understand the limit a lot better now and I’m perhaps in the best form in my entire career. Maybe it’s a bit too late, but all we can do is finish strong and see where that takes us for next season”.